Psychological research indicates that chocolate consumers consider the confection to be an unhealthy, yet extremely tasty treat – it is most frequently an impulse buy. Source: PhotoXPress. 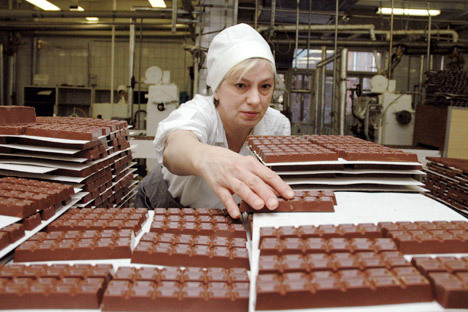 KPMG is forecasting rapid growth for the Russian chocolate market – 45 percent over the next three years. By contrast, growth in the world market for chocolate will only rise 2 percent annually. Experts see Russians moving up the value chain and increasingly purchase handmade chocolates, while manufacturers themselves do not expect such explosive growth. The study shows that Russia is one of the most promising emerging markets for chocolatiers. Its market is worth more than $8 billion and is expected to grow 45 percent by 2016. “The degree to which consumers are moving up to products with higher price tags is motivating producers to increase their output of handmade chocolates,” said Georgy Pataraya, Head of Consumer Markets at KPMG Russia and CIS. By comparison, U.S. consumers display an unwavering demand for high-quality products at affordable prices, as well as wild flavors such as bacon or wasabi. The overall drive toward healthy eating has yet to become a factor for chocolate consumption in the United States. Meanwhile, in Western Europe – which is still the largest chocolate market in the world – chocolatiers are increasingly concerned with the health of their consumers. In 2011, 10 percent of the new chocolate products launched in Western Europe were marketed as vegetarian, 7 percent as free from additives and 7 percent as satisfying organic food regulations. Psychological research indicates that chocolate consumers consider the confection to be an unhealthy, yet extremely tasty treat – it is most frequently an impulse buy. Chocolate consumption is expected to increase over the next one to two years and be driven by rising disposable incomes and expanding consumer lending, said Andrei Korkunov, the founder of the Odintsovskaya Confectionery. “I believe in the Russian market. Russians are being spooked with a crisis all the time, but life goes on – we still go to visit friends and bring gifts for our hosts. People want to live today and not worry about tomorrow. It’s an attitude that encourages spending cash on high-quality items, and I’d class high-quality chocolate in that category,” Korkunov said. At the same time, Korkunov only expects growth rates of between 5 to 7 percent annually for the chocolate market. The full version of the article was published in Russian in RBC Daily.